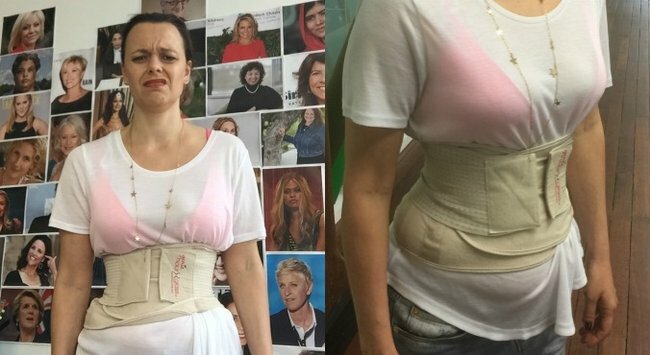 Mia Freedman just tried waist training so you don't have to. The modern version of the corset – “waist trainers” – claim to slim and define the mid-section. They’ve been spruiked by everyone from Jessica Alba to, well, basically the entire Kardashian Klan despite concerns from health experts. When one came into the office, Mamamia Women’s Network Content Director and co-founder Mia Freedman decided to take one for the team and try it on. No, it didn’t instantly turn her into a Kardashian. “Oh my gosh, I need to explain to you how it feels, I just can’t breathe, it makes me not want to talk which is a terrible thing for me,” she says. But it does more than just reduce your speaking ability. Over time the corset actually pushes your internal organs down and your ribs together, which can have some more serious – and immediate – consequences. "Do I look like a Kardashian yet?". Image: Supplied. "Because everything is so compressed, I can only take really small breaths and I feel really dizzy because I feel like I&apos;m not getting enough oxygen" she says. While makers recommend wearing the corsets for a minimum of eight hours per day, two minutes was enough for Mia. "I also feel like my ribs are about to start cracking, that&apos;s how it feels so I cannot imagine wearing it for days or hours or even another minute because I can&apos;t breathe," she says. In case the relief on Mia&apos;s face as she rips off the waist trainer isn&apos;t enough to put you off for good, long term waist training could actually lead to some other nasty health risks including pelvic floor weakness. Yes, it could make you wet your pants. "If worn longer term they could weaken core muscles, leading to back pain and pelvic floor weakness. If laced too tight they could even crack ribs or bruise skin or internal organs." So if you&apos;re looking to get in shape, ditch the corset and instead try a more effective option - healthy food and exercise. Have you tried waist-training before?